Some friends of mine came over to play in the kitchen yesterday afternoon. They are 10 and 8 years old and both demon cooks. Their favourite foods are French onion soup or sushi, they can bake a mean cake totally unaided and last time I went to their house they served a pre-dinner juice in passionfruit casings with umbrellas…. So now you can understand the proficiency of palette I’m dealing with. Frozen pizza and a Walls ice-cream would not cut it with these ladies. We spent the afternoon preparing a lavish supper for ourselves. The idea being that, having prepared a simple-yet-everso-slightly-chefy 3 course menu (below… we made a mess as you can see) with my occasional interventions and, I’d like to think, sage advice, they could go home and recreate it by themselves whenever they next hosted a dinner party (you’d be amazed what the under-10s get up to these days). Pre-heat the oven to 200oC. Break the woody ends off the asparagus and check for bugs. Tear the parma ham sheets in half. 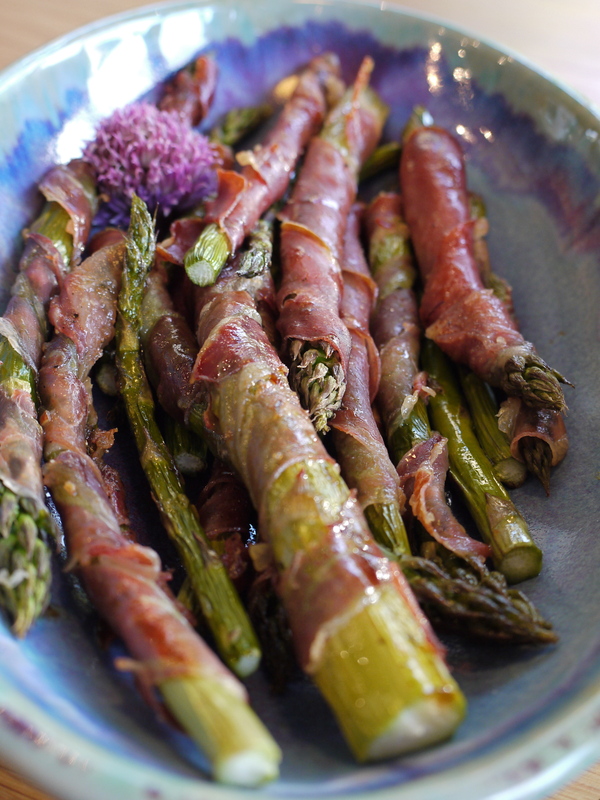 Wrap ½ a sheet of parma ham around each asparagus spear. Lay the asparagus on a well-oiled baking tray. Drizzle the asparagus with a little olive oil and season. Roast in the oven for approximately 15 minutes or until the asparagus is just soft and the ham crispy. 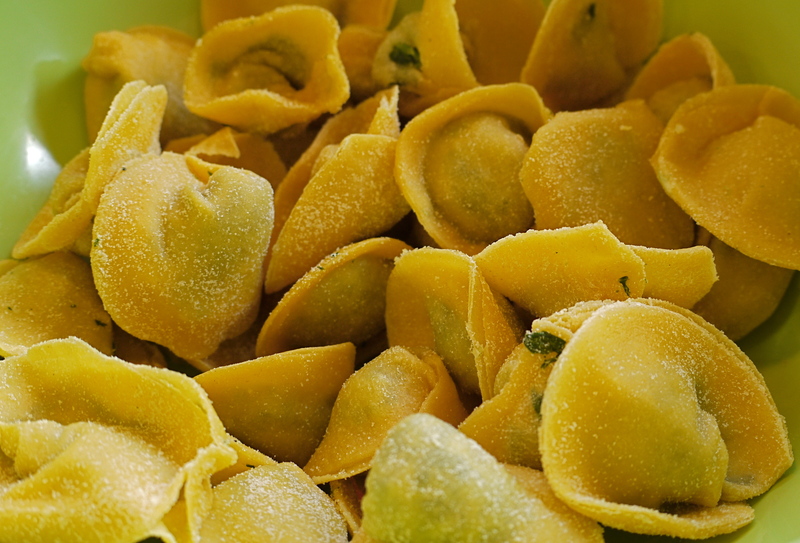 We used my pasta recipe and shaping process from this previous post, but altered the filling. Chop the shallots finely and sweat in a little oil until soft but not brown. Add the garlic and cook gently for 2-3 minutes. Grate the pecorino. Squeeze all the water out of the spinach and chop finely. Mix everything together, season and add a dollop of double cream to help the mix bind. 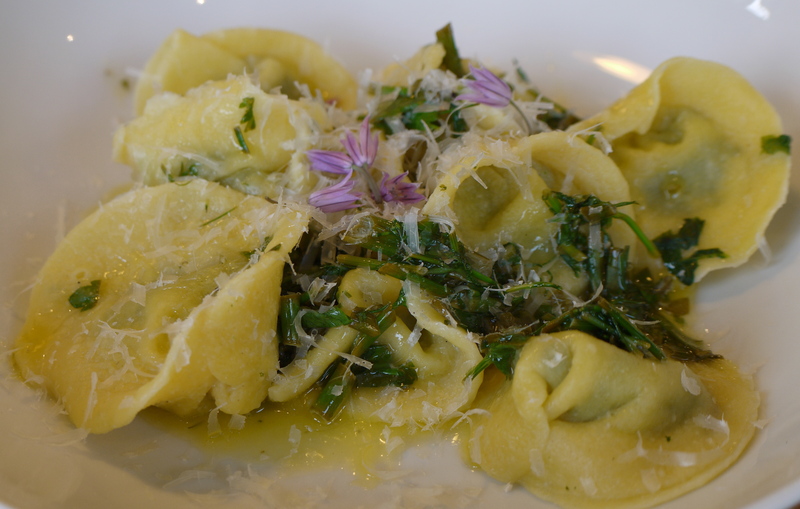 When you’re ready to serve the pasta, melt roughly 100g of butter in a pan, mix in a handful of herbs (whatever you have, but parsley, chervil and chives worked for us) and season. Drizzle the butter over the cooked pasta and tuck in immediately. The River Cottage Canteen in Axminster invented this I believe. I tried it there last week and it’s delish’ as, I believe, the youngsters say. It’s a glorious Frankenstein of a pudding that joins a fool with a crumble. I doubt this vague imitation is made with the delicacy and care of River Cottage, but it’s a tasty approximation nonetheless. Whip the cream into soft peaks. 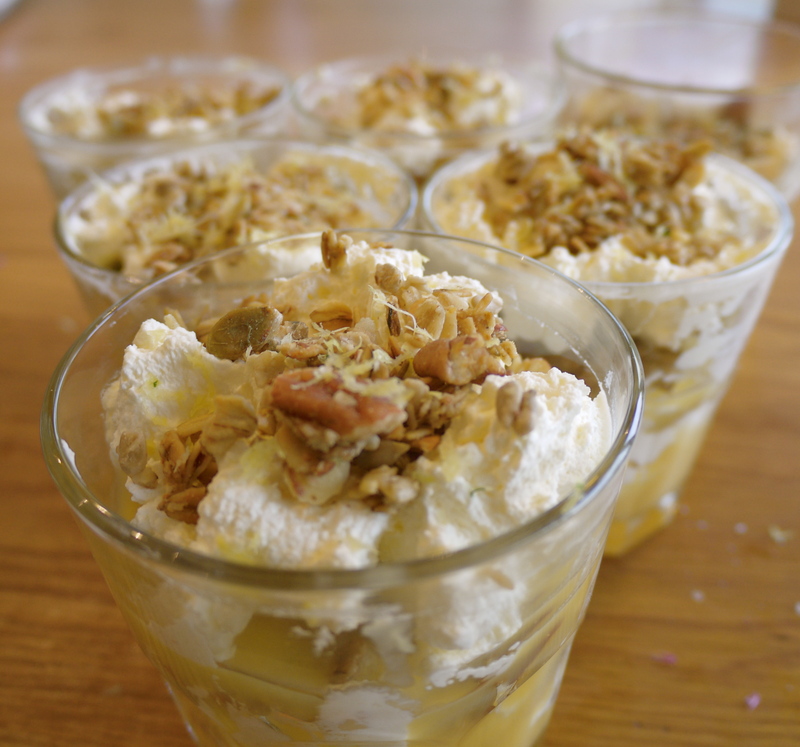 In small glasses, spoon in the lemon curd, cream and granola in layers like a lasagna. Finish with a layer of crumble, sprinkle with the lemon zest and serve. Enjoy the starter and main course at the table, with napkins and civilised conversation about the likely outcome of sports day. Then don PJs and de-camp to the sofa with the pudding to watch Star Wars til bedtime (that last bits, very important). Wow, what a delicious meal and what inspiring chefs your young visitors are! I’d better get training my 5 year old beyond jam tarts, would love it if she could rustle this up with me. Thanks Andrea. You’ve got me thinking about jam tarts now…. You definitely hang out with some talented young folk – I don’t know many (possibly any) who could produce such an delicious looking meal. Have you trained them to clear up as they go along too – now that would be really impressive! Thanks! Fortunately my other half arrived in time to do the washing up – a small price to pay for a fancy supper I reckon.